Water financial plan and rate study (including a 2016 update). Why Is a Capital Improvement Program Important? It allows for a systematic evaluation of all potential projects at the same time in a prioritized order. It allows for grouping of projects for construction, which will reduce overall program cost. It aids in the preservation of the MPWD’s infrastructure while ensuring the efficient use of public funds. It provides sound information to the Board of Directors and its customers on the infrastructure needs of the MPWD. Through its development, it allows an opportunity to foster cooperation among staff, management, and the District Engineer. It is a reinvestment of ratepayer dollars back into the water system, which is good financial stewardship. Operations staff, the District Engineer, and management teamed up and revised its construction standards and specifications, which was important not only for consistent construction application throughout the MPWD system for operations and maintenance, but also in preparation for a major capital improvement program and for development activity. The MPWD standards can be downloaded here. In preparation of a meaningful capital program, Operations staff, the District Engineer, and management systematically reviewed the MPWD’s infrastructure and developed a water hydraulic model to identify system deficiencies and rehabilitation areas. This was an 18-month process and one in which institutional knowledge of the MPWD system blended with engineering know-how and management experience resulting in the development of a comprehensive roster of needed capital projects. A distribution system analysis was performed and a report generated by the District Engineer for each capital project, including an engineering cost estimate (2015 dollars). Approximately 90 capital projects were identified, totaling over $50 million (2015 dollars). Operations staff developed pertinent criteria for evaluating the projects for prioritization, which resulted in the MPWD’s proposed CIP. Download the complete Comprehensive System Analysis & CIP here. A 5-Year CIP totaling $20 million was developed after the projects were ranked and discussed with the Board of Directors during 2015 and 2016. It was approved on May 26, 2016. The water hydraulic model is a valuable tool for MPWD operations and maintenance analyses, development assessments and fire flow reviews, and is well used and maintained to keep it resourceful. The MPWD hired an independent public finance consultant, Bartle Wells Associates, to work with staff for review and update of the MPWD’s development impact fees and structure. That nearly 9-month process was thoroughly vetted by the Board of Directors to ensure transparent stakeholder and customer participation and input. The result was a Water Capacity Charges Update dated March 20, 2015 that was adopted by the Board of Directors per Ordinance No. 112 dated April 23, 2015. Not only were Water Capacity Charges updated for new development requiring a “buy-in” to the MPWD system for its added service impact, but the MPWD also created water demand offset fees to manage the new demand within its available regional water system supply from the San Francisco Public Utilities Commission (SFPUC). This is in addition to the new development requirements to comply with current building codes requiring high efficiency water fixtures. Dependent upon the economy and local development within the MPWD service area, these revenue sources supplement funding available for capital projects and water conservation/education programs and public outreach. The MPWD updated its water financial plan and reviewed its rates and structure, again with the assistance of Bartle Wells & Associates. A rate workshop was held on March 26, 2015. A water financial plan and rate study was presented to the Board of Directors on May 26, 2015, including phased increases to the monthly fixed system charges and within the tiered structure. Further provisions adopted were “pass-through” of additional increases by the SFPUC to projected wholesale water rates, and emergency water shortage rates should the MPWD experience a significant decrease in its water commodity revenues as a result of water use reductions due to a drought. Download the plan and rate study here. Here is public notice for the water rate hearing conducted on June 25, 2015, including the proposed water rate increases over five (5) years, beginning July 1, 2015. Water rate increases were adopted by the Board of Directors on June 25, 2105, per Ordinance No. 114 and its Exhibit A – Schedule of Rates and Fees. In Fiscal Year (FY) 2015/2016, water conservation efforts resulted in lower revenue receipts. Therefore, the MPWD contracted with Bartle Wells & Associates to review and update its 2015 financial plan and rate study in order to adequately prepare for the FY 2016/2017 budget process. On April 28, 2016, the Board of Directors received the Bartle Wells & Associates updated financial and rate report dated April 24, 2016. Cash flow projections were decreased as a result of the reduced water sales (drought impacts), and the water rate increase approved in 2015 was recommended for implementation. The potential for debt financing for the MPWD CIP was analyzed and it was concluded that an annual debt service payment of $1,045,000 could be achieved, even with the reduced cash flow projections. Finally, excess revenues were forecasted resulting in sufficient coverage required for debt financing. Click the map below to zoom and navigate. Water financial plan and rate study, including a 2016 update. First, senior Operations staff, management, and the District Engineer teamed up and revised its construction standards and specifications. These were important not only for consistent construction application throughout the MPWD system for future operations and maintenance, but also in preparation for any major capital improvement program. They are posted at the MPWD website here. Next, in preparation of a meaningful capital program, the same team systematically reviewed the MPWD’s infrastructure and developed a water hydraulic model to identify deficiencies. This was an 18-month process and one in which institutional knowledge of the MPWD system blended with engineering know-how and management experience resulting in the development of a comprehensive list of needed capital projects within the MPWD system. A distribution system analysis was developed by the District Engineer for each project, including an engineering cost estimate. Nearly 90 capital projects were identified, totaling over $50 million. Operations staff selected several pertinent operational and coordination criteria for evaluating the projects for prioritization. That priority list resulted in the MPWD’s proposed Capital Improvement Program (CIP). A 5-year CIP was developed from this list. The water hydraulic model is a valuable tool for operations and maintenance analyses, development assessments and fire flow reviews, and is maintained to keep it current. Third, the MPWD hired an independent public finance consultant, Bartle Wells Associates, to work with staff for review and update of the MPWD’s development impact fees and structure. That nearly 9-month process was thoroughly vetted by the Board of Directors to ensure transparent stakeholder and customer participation and input. The result was a Water Capacity Charges Update dated March 20, 2015 and adopted by the Board of Directors per Ordinance No. 112 dated April 23, 2015. Not only were water capacity charges updated for new development requiring a “buy-in” to the MPWD system for its added service impact, but the MPWD also created water demand offset fees to manage the new demand within its available regional water system supply from San Francisco Public Utilities Commission (SFPUC), especially during water shortages. This is in addition to the new development requirements to comply with current building codes requiring high efficient water fixtures. These supplemental revenues depend upon the level of proposed development within the MPWD service area, but are additional resources for capital projects and water conservation/educational programs and public outreach. Finally, the MPWD updated its water financial plan and reviewed its rates and structure, again with the assistance of Bartle Wells Associates. A rate workshop was held on March 26, 2015. A water financial plan and rate study was presented and adopted by the Board of Directors on May 26, 2015, including phased increases to the monthly fixed system charge and within the tiered structure. Further provisions adopted were pass-through of additional increases by SFPUC to projected wholesale water rates, and emergency water shortage rates should the MPWD experience a significant decrease in its water commodity revenues as a result of greater water use reductions due to a drought. In FY 2015/2016, water conservation efforts within the MPWD system resulted in lower revenue receipts as well as associated purchased water costs. Therefore, the MPWD contracted with Bartle Wells Associates to update its 2015 finance and rate study in order to adequately prepare for the FY 2016/2017 budget process. The Board received an updated financial report on April 24, 2016. The cash flow projections were decreased as a result of the reduced water consumption, while at the same time considering rate increases effective July 1, 2016. Bartle Wells Associates also took into consideration the potential for a debt financing, and concluded that an annual debt service payment of $1,045,000 could be achieved, even with the reduced cash flow projections. Lastly, excess revenues were forecasted resulting in sufficient coverage required for a debt financing. Prioritized projects were presented to and accepted by the Board as a capital program. Staff has been working with its municipal finance advisor, Wulff Hansen & Company, since January 2016, to identify potential options for financing a 5-year CIP. The Board of Directors considered three (3) 5-Year CIP alternatives at its regular meeting on May 26, 2016. They selected Alternative One totaling $20,000,000 and approved Resolution No. 2016-06, which is attached, including the authorized 5-Year CIP. As a result of the detailed capital infrastructure modeling and analyses performed, the District Engineer and staff created a report entitled MPWD Comprehensive System Analysis and Capital Improvement Program FY 2016/2017 Update, which was adopted by the Board at its regular meeting on May 26, 2016 (via Resolution No. 2016-06). 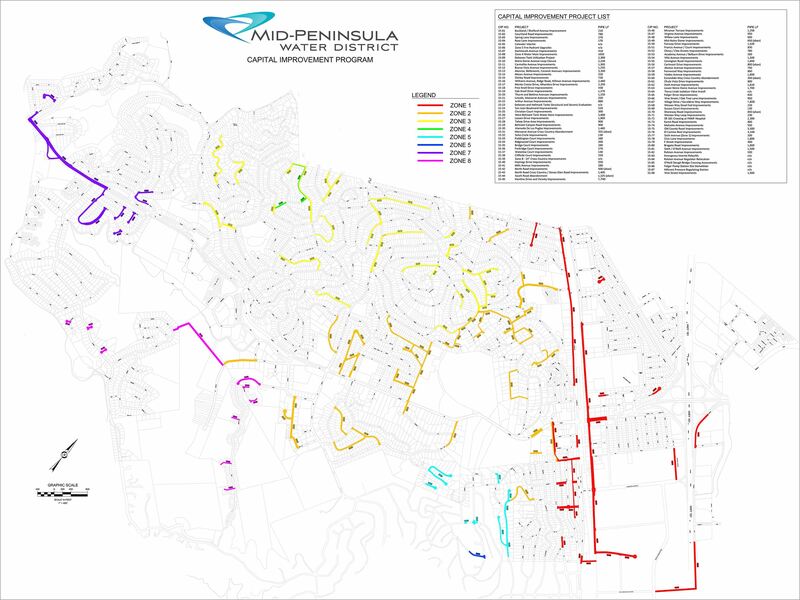 During the summer of 2016, the District Engineer and staff developed an added section to the MPWD Comprehensive System Analysis and Capital Improvement Program FY 2016/2017 Update, including their asset management analysis of MPWD water mains and storage tanks and annual pay-go reinvestment requirements. The added section was presented to the Board during its regular meeting on August 25, 2016. Exhibit A of the 5-year Capital Improvement Program FY 2016/2017 through 2020/2021 is available for download (PDF). Also available are the 2016 COP Requisitions for Disbursements from Project Fund (see below). These requisitions are formal project fund requests by the MPWD through its COP program Trustee, BNY Mellon. Payments are made directly to the listed payees by BNY Mellon. These expenditures are included in the MPWD 2016 COP Project Fund Quarterly Reports. Exhibit D – Comparisons – Premium Bonds to Par Value Bonds (pp. 22-28) dated August 24, 2016, and prepared by MPWD Municipal Finance Advisor, Wulff, Hansen & Co. The MPWD’s practice has been to appropriate a certain dollar amount per year, typically between $1 million to $1.5 million dollars, to fund capital projects on a cash “pay go” basis. There is no systematic way of evaluating if this level of funding was adequate to ensure the timely replacement of MPWD infrastructure. The pay-go system has allowed the MPWD to slowly replace some deficient distribution pipeline segments and rehabilitate or replace some tanks that were not seismically safe. But much of the MPWD water system is more than 50 years old and is spread out over nine (9) distinct pressure zones. The system’s age in combination with system pressures exceeding 120 pounds per square inch (psi), have led to and continue to create many water leaks, which has wasted millions of gallons of water and resulted in personnel and maintenance costs to repair main breaks. The comprehensive analysis resulting from the water hydraulic modeling indicates the MPWD has historically been underfunding its capital infrastructure needs and now must undertake an accelerated program to catch up. If it does not, the MPWD system risks falling further behind and being vulnerable to severe damage during a large seismic event and increased maintenance costs. The external financial auditor, James Marta & Company, reported on November 18, 2015, that the MPWD’s existing capital replacement is not keeping pace with the annualized depreciation of the system, thereby an increased level of capital spending was recommended. Continue on a “pay-go” basis. Utilize available revenues to pay for planned projects. It will take 16 years to pay for $25 million planned 5-year CIP. Cost of unexpected maintenance will reduce available funds and extend over 16 years’ completion of planned projects. Current ratepayers pay for capital projects while future ratepayers do not pay an equitable share. The MPWD may experience an impairment of its operations due to delayed needed infrastructure improvements. A hybrid approach, including a combination of debt and “pay go.” Debt will be issued to complete capital projects and use all excess revenues that can be used for “pay go” or pay down the debt, which shortens the term of the debt. Returning to only “pay go” depends upon how much of the excess revenues after debt service is applied to early payment of the debt. First additional reduction of the debt beyond the scheduled payment of principal will occur after 10 years. Four (4) cash sources were identified for CIP funding on a continued “pay-go” basis, or for annual loan/debt service payments, or a combination of both: Water revenues, development impact revenues, reserves, or real property sales. The Board of Directors would authorize the funding source(s) for any approved CIP. Water revenues can be used for any type of improvement related to the MPWD’s business. Development impact revenues are normally used and may have statutory requirements such that they can only be used to support the construction of new infrastructure and facilities to support the impacts of growth to the system. Real property sales proceeds, generally speaking, and unless restricted, could be used as a source of funding. Ben“Bud” Levine and Edmund Viray of Wulff, Hansen & Company presented an overview of the $18,750,000 COP (Certificates of Participation) sale on December 7, 2016 for the MPWD’s CIP financing. A 08. Certificate of Award to Citigroup Global Markets Inc. The par amount of the COPs sold on December 21, 2016, was $18,570,000 for the MPWD’s CIP (Capital Improvement Program). A premium of $938,447.30 was added to bring the total sale proceeds to $19,508,447.30. Underwriters fees were $114,426.48, resulting in net proceeds totaling $19,143,020.82, as reflected in the Sale and Delivery of Certificates chart below from the first quarterly report delivered to the Board of Directors on April 27, 2017. The MPWD is required to file annual Continuing Disclosure Reports associated with the 2016 COP debt financing for its CIP, and it contracted with Dan Bergmann of IGServices to provide those services. The letter agreement for Mr. Bergmann’s professional services can be found here. The MPWD’s Annual Continuing Disclosure Reports are publicly presented and available below. State Route 101 Crossing at PAMF (Project 15-72); CIP #04-1621-CP; currently in engineering design phase; Board awarded design services to West Yost Associates on May 25, 2017. Two State Route 101 (SR 101) water main crossings exist in Zone 1 including a 500 LF 12" asbestos cement (AC) crossing between Karen Road and Sem Lane and another 12" polyvinylchloride (PVC) crossing a half mile to the north. The 12" AC was installed in 1963 in a 36" steel casing. As part of the PAMF development agreement at the south end of Zone 1, the District obtained a 15 ft easement along the northeast side of the PAMF property In addition to a 40 ft x 40 ft area In the northeast corner to serve as a staging area for an alternate SR 101 crossing. This project abandons the aging 12" AC crossing and relocates it to the PAMF easement with a new 1,100 LF 12" PVC water main. To loop the water main back to the existing water main on Shoreway Road requires the installation of an additional 1,200 LF 8" PVC. Hydraulic analysis indicates increased fire flows along Shoreway Road of approximately 200 gpm. This project will require extensive Caltrans coordination. Distribution System Analysis No. 077. El Camino Real Improvements (Projects 15-74 and 15-76); CIP #06-1621-CP; currently in engineering design phase; Board awarded design services to Hydroscience Engineers, Inc on May 25, 2017. The neighborhood along Malcolm Avenue, Anita Avenue, Julia Court, and Belmont Avenue is currently served by Zone 2 and consists of 55 residences and 5 fire hydrants. Streets to the immediate north of Malcolm Avenue and those on Ruth Avenue and North Road are all served by Zone 1. The zones are connected at the North Road Regulating Station in addition to four other connections via closed valves creating 5 dead ends within the area. This project eliminates all the dead ends except the one associated with the North Road Regulator by installing a new parallel 550 LF ductile iron pipe (DIP) water main along the existing Zone 2 water main on Malcolm Avenue. The existing Zone 2 water main would become part of Zone 1 and the new water main would become part of Zone 2. Hydraulic analysis Indicates a static pressure loss of approximately 40 psi to an average 98 psi with the Zone 2 to Zone 1 switch. Fire flows are minimally affected with differences around 100 gpm on average however the majority of the nows are above 2,000 gpm. Distribution System Analysis No. 079. Old County Road Improvements (Projects 15-75, 15-79 and 15-82); CIP #05-1621-CP; currently in engineering design phase; Board awarded design services to Schaaf and Wheeler Consulting Civil Engineers on September 28, 2017. Old County Road spans the entire length of Zone 1 and has approximately 5,000 LF of various 4", 6" and 8" cast iron pipe (CIP) and asbestos cement (AC) water mains installed in the 1930s/1940s located on the east side of the road. In addition, approximately 3,100 LF of 10" and 12" polyvinylchloride (PVC) and polyethylene (PE) water mains in steel casings were installed in the late 1980s and parallel the CIP and AC on the left side of the road. There are approximately 111 service connections, 15 fire service connections, and 11 fire hydrants along the CIP/AC water mains. Hydraulic analysis indicates the larger parallel water mains (10"-12") provide no significant fire flow benefit to the zone. This project abandons 6,475 LF of various sized parallel water main and replaces all of the 6"- 8" CIPIAC with 8" PVC (3,700 LF) and 1,800 LF of 20" CC with 20" PVC from Bragato Road to Marine View Avenue. Distribution System Analysis No. 080. F Street is located in the southern portion of Zone 1 and crosses El Camino Real where it dead ends before the railroad tracks. A short 150 LF 6" polyvinylchloride (PVC) water main provides service to one business and a hydrant on F Street. Directly to the south of F Street, the District has a 350 LF 10" concrete (CC) water main located in an easement on the CVS property and is 1 of 5 railroad crossings connecting Old County Road with El Camino Real. The 10" CC was installed in 1963 and is currently out of service due to main break with the exact location of the break unknown. This project relocates the existing 10" CC out of the CVS easement to F Street and installs a new 400 LF 8" PVC. The existing 10" CC will be used as a casing for the new 8" PVC underneath the tracks. Hydraulic analysis indicates this particular crossing does not provide significant fire flow benefit however it does provide other benefits including system redundancy and relocation of a water main out of an easement onto public right-of-way. Distribution System Analysis No. 084. The 500 LF 6" cast iron (GIP) water main along Ralston Avenue between Old County Road and Elmer Street was identified by maintenance personnel as a preferred capital improvement project. The GIP was installed in 1937 and it is probable this water main could experience a significant break in the future. Given the location on the highly traveled Ralston Avenue, a main break would not be ideal and would cause major traffic disruptions. This project replaces the existing 6" GIP with a new 8" polyvinylchloride (PVC) in addition to 5 service replacements and 1 fire hydrant. Traffic control on Ralston Avenue will be challenging where night time work may be a possibility to minimize traffic disruptions. Hillcrest Pressure Regulating Station (Project 15-87); CIP # 02-1621-CP; currently in engineering design phase; Board awarded design services to Pakpour Consulting Group (District Engineer) on February 23, 2017. The District's water Is supplied from the SFPUC at two main Inlets: the Tunnels Pump Station, located on Canada Road near the Crystal Springs Reservoir, and Hillcrest Meters, located In Redwood City. The Tunnels Pump Station sends water Into Zone 8 (the highest zone In the District) and the Hillcrest Meters sends water Into Zone 1 (the lowest zone In the District). The Hillcrest Meters connection Is a simple connection with a flow meter and has no pressure regulating capabilities. The District has reported multiple pressure fluctuations In Zone 1 due to SFPUC oscillating pressures upstream of the meter. Because of the incapability of regulating pressures downstream of the SFPUC connection, the District has run Into operational Issues. This project Installs a pressure regulating station consisting of multiple pressure reducing valves (PRV) to operate under specific Zone 1 operating conditions. A new vault wlll be constructed downstream of the HIiicrest Meters and will house up to 3 PRVs, two 6" and one 8". Each PRV wlll operate under conditions such as low flows, high demands, and under Hannibal Pump Station operation. During June, Stoloski & Gonzalez (S&G) placed the final permanent paving, slurry sealed and striped. Work during this period also included miscellaneous concrete work and replacement of the fire service connection at Dairy Lane. On July 16, 2018, the District deemed the project substantially complete and issued a punchlist with 20 items. For more details, download the MPWD 2017 WMR July 2018 Project Update. During May, all tie‐ins along Karen Road were completed and the 8‐inch Fusible PVC water main is fully in service. All service connections were transferred from the old water main to the new water main and all sites were paved and prepped for slurry seal. As of June 1, 2018, 8 out of 175 working days remain on the contract (110 contract days with an additional 65 days for Change Orders No.1, thru No.5), with approximately 3% of the work remaining. Remaining work includes slurry seal and striping which will be completed in June. After street restoration, the District will walk the site along with the City of Belmont and S&G to finalize the project punchlist. For more details, download the MPWD 2017 WMR June 2018 Project Update. During April, all the tie‐ins along Arthur Avenue were completed. The 8‐inch DIP water main is fully in service and all the service connections were transferred from the old pipe to the new 8‐inch water main. In addition, 8‐inch Fusible PVC pipe at Karen Road was fully fused by R&B company and pulled through the existing 12‐inch host pipe by S&G without major incidents. As of April 1, 2018, the project has 27 out of 173 working days remaining on the contract (110 contract days with an additional 53 days for Change Orders No.1, thru No.4), with approximately 13% of the work remaining. Remaining work on South Road, Folger Road, Folger Court, Mezes Avenue, and Arthur includes slurry seal and striping. Remaining work on Karen Road includes three tie‐ins, service connections, Fire Hydrants, paving, slurry seal, and striping. For more details, download the MPWD 2017 WMR May 2018 Project Update. During March, with nine rain days, S&G only had a total of 13 working days. During this month 8-inch water main, 8-inch PRV station and all the fire hydrants along Arthur Avenue were installed. Starting in April, S&G will complete the tie-ins along the Arthur Avenue and will move the service meter connections over to the new water main, at the same time an additional crew will install the 8-inch water main along Karen Road. On March 08, 2018, S&G requested an additional 35 working days to be added to the contract mainly due to lower production rate caused by unforeseen problems such as utility conflict, changes in water main alignments, etc. The District project team evaluated S&G request and ultimately decided to grant S&G an additional 20 working days. As of April 1, 2018, the project has 36 out of 161 working days remaining on the contract (110 contract days with an additional 51 days for Change Orders No.1, No.2, and No.3), with 32% of the work remaining. Remaining work on South Road, Folger Road, Folger Court and Mezes Avenue, includes slurry seal and striping. Remaining work on Arthur Avenue includes three tie-ins, service connections, paving, slurry seal, and striping. For more details, download the MPWD 2017 WMR April 2018 Project Update. During February, water main installation and all the tie‐ins along Mezes Avenue were completed. The new water main is in full service with all service connections transferred. During the last week of February, S&G began construction on Arthur Avenue while a smaller crew wrapped up remaining work on Mezes Avenue. During the last week of February, S&G began construction on Arthur Avenue which is anticipated to last three to four weeks subject to weather conditions. As of March 1, 2018, the project has 30 of 132 working days remaining on the contract (110 contract days with an additional 22 days for Change Orders No.1 and No.2), with 50% of the work still remaining. Delays were caused by unforeseen site conditions, water main alignment modifications to avoid existing unknown utilities, and traffic control. Although S&G is using additional crews and staff to make up lost time, they are still behind schedule. S&G is currently working to update the construction schedule however may approach the District in the coming weeks to request additional working days. Meanwhile, they are using larger crews on Arthur Avenue and when they move to Karen Road near the end of March. Remaining work on South Road, Folger Road, Folger Court and Mezes Avenue, includes slurry seal and striping. For more details, download the MPWD 2017 WMR March 2018 Project Update. During January, all the tie‐ins along the Folger Drive were completed. New water main along Folger Drive and Folger Court are now fully in service, and all the service connections are transferred. During the last weeks of January S&G start construction on Mezes Avenue, while the additional crew was wrapping up the remaining work on Folger Drive and Folger Court. Remaining work on South Road includes slurry seal and roadway striping. Remaining work on Folger Road and Folger Court includes installation of meters’ retaining walls and finishing the road restoration including, trench paving, slurry seal, roadway striping, sidewalks and resident landscaping around the new water meter boxes. For more details, download the MPWD 2017 WMR February 2018 Project Update. During November, all the tie‐ins along the South Road were completed. The 8‐inch PVC water main is now fully in service and all the service connections are transferred from the 4‐inch to the 8‐inch water main. During December Stoloski & Gonzalez (S&G) moved to Folger Road and was able to install approximately 800 LF of 10‐inch water main along Folger Drive and 100 LF of 8‐inch water main along Folger Court. During the last week of November and again the last two weeks of December, S&G added additional crews, while one crew was wrapping up the remaining work on South Road the main crew was on Folger Drive. Remaining work on South Road includes installation of a fire hydrant, air release valve, meters’ retaining walls and finishing the road restoration including, slurry seal, roadway striping, sidewalks and resident landscaping around the new water meter boxes. Remaining work on Folger Road including, tie‐ins, transferring service connection, installation of a fire hydrant, air release valve, finishing the road restoration including, slurry seal, roadway striping, sidewalks and resident landscaping around the new water meter boxes. Because of a few rainy days, unforeseen utility crossing, and slower construction progress, S&G is slightly behind schedule. S&G is trying to get back on schedule by adding additional crews. For more details, download the MPWD 2017 WMR January 2018 Project Update. CONSTRUCTION STATUS: On July 27, 2017, the Mid‐Peninsula Water District (MPWD) awarded Stoloski & Gonzalez, Inc. (S&G) the Karen, Mezes, Arthur, South & Folger Water Main Improvements Project. The contract was executed on August 4, 2017 and a pre‐construction meeting was held on August 23, 2017. The District issued the Notice to Proceed for October 2, 2017. District employee Michael Anderson is providing full time, onsite inspection for this project. S&G began construction along South Road on October 2, 2017. Work along South Road for October included potholing existing utility locations, installing three 3‐valve assemblies to avoid shutdowns during service meter installations, transferring service connections on the existing 4‐inch CIP water main to the larger 8‐inch PVC main, and installing 1 fire hydrant assembly. Change Orders: As of October 31, 2017, no change orders for this project have been processed. Project Schedule and Request for Progress Payment No. 1: As of October 31, 2017, S&G completed 7% of the contractual work ($142,200.00). Enclosed please find Progress Payment No. 1 due S&G for this period for $135,090.00 (value of work less 5% retention). The work performed to date has been satisfactory and payment is recommended. For more details, download the MPWD 2017 WMR November 2017 Project Update. In May 2016, the MPWD Board of Directors approved a capital improvement project list totaling 22 projects throughout the community with a cost estimate exceeding $23 million. These projects had been prioritized mainly due to their history of repairs and pipe age. With the list of projects approved, the Board then focused on how to pay for these needed infrastructure improvements. Following several months of careful deliberation, the Board authorized the issuance of nearly $20 million in “certificates of participation” at historically low interest rates. With a list of approved projects and funding in place, MPWD staff secured professional engineering services to augment the District Engineer for the design of several complex capital improvement projects. In October 2017, the Water Main Replacement Program began construction. This $2 million program, representing the first five capital projects, will replace water mains in Arthur Avenue, Folger Drive, Karen Road, Mezes Avenue, and abandon an old water line under South Road. The 2018 Water Main Replacement Project defined by improvements to Tahoe Drive, the Notre Dame Loop Closure, Cliffside Court improvements, fire hydrant improvements on Desvio Way, Solano Drive, and Altura Way. It is anticipated that construction of these projects will take place throughout 2018/2019. More detailed information will be provided by MPWD as these projects get ready for construction. These projects, which were combined into one project for construction cost savings, are identified among the highest priority projects within the Mid-Peninsula Water District’s (MPWD) Capital Improvement Program developed in 2015 after extensive water hydraulic modeling of the entire MPWD system. MPWD’s total estimated cost for all five projects is $2.5 million, including engineering design, project management, and construction. It will be funded with proceeds from a 2016 long-term debt financing. The MPWD cordially invites you to an open house it is hosting regarding these projects on Wednesday, July 19, 2017, from 5:00 pm to 6:30 pm, at the MPWD headquarters at 3 Dairy Lane in Belmont. Please come and learn more about the projects and interact with the project team. Joint Water/Sewer Project with City of Belmont (Projects 15-43, 15-51 and 15-53); CIP #03-1621-CP; design completed; project bid opening January 10, 2018; City of Belmont Public Works is the lead agency; District inspecting their water improvements and paying their fair share of construction related costs; don’t have construction start date but anticipate it will be within next 30-60 days; Board awarded design services to Schaaf and Wheeler Consulting Civil Engineers on January 26, 2017. The water mains along Davey Glen Road were Installed in 1961 and comprise of 600 LF of 6" cast iron pipe (CIP) and 800 LF of 8" CIP. Water is supplied to Davey Glen from Middle Road and a 6" CIP cross country (CC) water main, installed in 1962, extending down from North Road to where the 6" CIP on Davey Glen transitions to the 8" CIP. The CC water main runs beneath a 4 ft wide sidewalk along a dedicated easement. This project abandons the CC water main and replaces 1,400 LF of CIP water main along Davey Glen Road with 8" DIP to correct fire flow deficiencies upon the CC abandonment. Francis Avenue is located between Fairway Drive and Notre Dame Avenue and has a 640 LF 4" polyvinylchloride (PVC) water main installed in 1975. Francis Court is located directly off Francis Avenue and also has 190 LF of 4" PVC installed in 1976. This project replaces a total 830 LF of 4" PVC with 8" ductile iron pipe (DIP) and adds an additional hydrant in the area. Academy Avenue between Ralston Avenue and Belburn Drive has two parallel water mains: a 600 LF 4" polyvinylchloride (PVC} water main installed in 1970 and a 6" cast iron (GIP} water main installed in 1977. Hydraulic analysis indicates the existing 4" PVC provides little hydraulic benefit to the system. It is assumed the existing services are located on the 4" PVC. In addition, Belburn Drive between Academy Avenue and Villa Avenue also has a 300 LF 4" PVC water main incapable of achieving the minimum recommended fire flow. The two 4" PVC water mains aforementioned connect to each other at Academy Avenue. This project abandons the existing 4" PVC on Academy Avenue, relocates 22 service connections to the existing 6" GIP, and replaces 150 LF of PVC on Belburn Drive with 8" ductile iron pipe (DIP) connecting it to the existing 6" GIP on Academy Avenue. The existing 6 inch and 8 inch cast iron pipe (CIP) water mains along Alameda de las Pulgas between Cipriani Boulevard and Arbor Avenue were installed in the mid-1950s and have experienced numerous water main breaks over the past several years. The Mid-Peninsula Water District (MPWD) replaced a 320 LF section from Belle Monti Avenue to Coronet Boulevard in recent years. The upcoming project will replace the remaining sections of water main between Cipriani Boulevard and Arbor Avenue with new 8 inch ductile iron pipe (DIP), eliminating the 6 inch and 8 inch aged pipe along this road. This project is identified among the highest priority projects within the MPWD’s Capital Improvement Program developed in 2015 after extensive water hydraulic modeling of the entire MPWD system. Click on the link to view the road closure detour maps. Time lapse video of the Mid-Peninsula Water District (MPWD) Buckland Water North Tank replacement project, from start to finish. Plans to replace two water storage tanks on Buckland Avenue in San Carlos are 100% complete. Local utilities relocated a utility pole and power lines away from the tank site. The MPWD project team met with neighbors in the area to obtain input on the project. Construction is due to start mid-March, and will take approximately six months to finish. When complete, residents will have two seismically resistant tanks to provide drinking water and fire protection. The more than 50-year-old tanks were not earthquake resistant and potentially could leave customers in the area without water service or fire protection following an earthquake. The following is a zone by zone breakdown of identified projects, according to the Comprehensive System Analysis and Capital Improvement Program FY 2016 – 2017 Update. Those projects generated as a result of a DSA report are identified accordingly. 15‐68 ‐ Wessex Way Dead End Improvements – Replaces 220 LF of a dead end 4” PVC with 8” PVC to replace aging / undersized infrastructure and improve fire flows. 15‐69 ‐ Sussex Court Improvements – Replaces 130 LF of a dead end 4” PVC with 8” PVC in addition to a new fire hydrant to replace aging / undersized infrastructure and improve fire flows. 15‐70 ‐ Shoreway Road Improvements – Abandons 850 LF of 8” AC paralleling a 12” PVC to eliminate aging infrastructure and reduce maintenance. 15‐71 ‐ Wessex Way Loop Improvements – Eliminates an 825 LF 6” PVC dead end by installing 230 LF of 8” PVC to loop the water main within the Sterling Place Development, provides system redundancy, improves fire flows, and improves water quality. 15‐72 ‐ SR 101 Crossing at PAMF Hospital – Abandons 500 LF of 12” AC under SR 101 in favor of a new 12” PVC crossing at the PAMF location eliminating aging infrastructure, dead ends, creates a looped system, and constructs a serviceable underground inter‐tie utility vault. 15‐74 ‐ Malcolm Avenue Improvements – Installs 550 LF of 8” DIP to allow a Zone 1 and Zone 2 boundary reconfiguration improving static pressures, eliminating 4 dead ends, and creating looped systems in both Zones. 15‐75 ‐ Old County Road Improvements – Abandons 6,475 LF of parallel water mains and installs 3,700 LF of 8” PVC to replace aging infrastructure, reduce maintenance, and improve fire flows. 15‐76 ‐ El Camino Real Improvements – Replaces 4,100 LF of 8” CIP with 8” DIP to replace aging infrastructure, reduce maintenance, and improve fire flows. 15‐77 ‐ Sixth Avenue (Zone 1) Improvements – Installs 200 LF of 8” DIP and a 6” PRV to eliminate 4 dead ends, provide Zone 1 redundancy with a Zone 2 connection, and to improve water movement. 15‐78 – Civic Lane Improvements – Replaces 1,800 LF of various sized water main with new 8” DIP to replace aging infrastructure, shorten a dead end, loop the water main, and improve fire flows. 15‐79 – F Street Improvements – Installs 400 LF of new 8” DIP to replace an out‐of‐service 10” CC with an unknown break location, relocates District facilities out of private property, increase system redundancy. 15‐80 – Bragato Road Improvements – A replacement / new installation combination of 1,000 LF of 8” PVC to replace aging infrastructure, shorten a dead end, loop the water main, and improve fire flows. 15‐81 ‐ Sixth / O’Neill Avenue Improvements – Abandons 1,400 LF of 4”‐8” CIP/PVC and replaces 1,500 LF of 18” CC with DIP to eliminate parallel water mains, reduce maintenance, and improve fire flows. 15‐82 ‐ Ralston Avenue Improvements – Replaces 500 LF of 6” CIP with 8” PVC to replace aging infrastructure. 15‐84 – Ralston Avenue Regulator Relocation – Relocates the regulating station to a more accessible location. 15‐85 – O’Neill Slough Bridge Crossing Assessments – Assesses existing water main conditions, their associated suspension systems, and seismic resistance. 15‐87 – Hillcrest Pressure Regulating Station – Installs a pressure regulating station off the District’s Zone 1 connection to SFPUC to eliminate Zone 1 pressure fluctuations. 15‐41 ‐ Mills Avenue Improvements – Replaces 280 LF of 4” CIP with 8” DIP and adds an additional fire hydrant to replace aging / undersized infrastructure and improve fire flows. 15‐42 ‐ North Road Improvements – Abandons 500 LF of 8” CIP paralleling an 8” PVC and relocates services to the 8” PVC to eliminate aging infrastructure and reduce maintenance. 15‐43 ‐ North Road Cross Country / Davey Glen Road Improvements – Abandons 400 LF of cross country 6” CIP and replaces 1,400 LF of 6”‐8” CIP with 8” DIP to eliminate the cross country water main, reduce district maintenance, and replace aging infrastructure. 15‐44 ‐ South Road Abandonment – Abandons 1,325 LF of 4” CIP paralleling an 8” PVC and reconnects the branches to the 8” PVC to reduce maintenance, eliminate aging infrastructure and improve fire flows. 15‐45 – Hainline Drive and Vicinity Improvements – Abandons 400 LF of cross country 4” CIP, replaces 1,740 LF of 4” CIP with 8” DIP along with additional hydrants to eliminate a cross country water main and to improve fire flows. 15‐46 – Miramar Terrace Improvements – Replaces 1,250 LF of 4” CIP with 8” DIP to replace aging / undersized infrastructure and improve fire flows. 15‐47 – Virginia Avenue Improvements – Abandons 210 LF of cross country 6” CIP/PVC and replaces 950 LF of 6” CIP with 8” DIP to abandon an inaccessible cross country water main, replace aging infrastructure, and improve fire flows. 15‐48 – Willow Lane Improvements – Abandons 230 LF of cross country 4” CIP in favor of a new 600 LF 8” DIP located within the roadway and adds a fire hydrant to eliminate a cross country water main and improve fire flows. 15‐49 – Mid‐Notre Dame Avenue Improvements – Abandons 650 LF of 6” CIP paralleling an 8” CIP to remove aging infrastructure and reduce maintenance. 15‐50 – Fairway Drive Improvements – Replaces 1,420 LF of 4” PVC with 8” DIP and adds an additional fire hydrant to eliminate undersized insfrastructure and improve fire flows. 15‐51 – Francis Avenue / Court Improvements – Replaces 830 LF of 4” PVC with 8” DIP and adds an additional fire hydrant to eliminate undersized infrastructure and improve fire flows. 15‐52 – Chevy / Clee Streets Improvements – Replaces 780 LF of 4” PVC with 8” DIP and adds an additional fire hydrant to eliminate undersized infrastructure and improve fire flows. 15‐53 – Academy Avenue / Belburn Drive Improvements – Abandons 600 LF of 4” PVC paralleling a 6” CIP and replaces 300 LF of 4” PVC with 8” DIP to eliminate undersized infrastructure and improve fire flows. 15‐54 – Villa Avenue Improvements – Replaces 1,500 LF of 4” PVC / 6”CIP with 8” DIP to replace aging / undersized infrastructure and improve fire flows. This project also reconfigures water services connections so each resident has their own dedicated service line. 15‐55 – Covington Road Improvements – Replaces 1,000 LF of 4” CIP / 6”DIP with 8” DIP and adds an additional fire hydrant to replace aging / undersized infrastructure and improve fire flows. 15‐56 – Carlmont Drive Improvements – Abandons 800 LF of 8” CIP paralleling a 10” PVC to reduce maintenance. 15‐57 – Alomar Way Improvements – Replaces 750 LF of 4” CIP with 8” DIP to replace aging / undersized infrastructure and improve fire flows. 15‐58 – Fernwood Way Improvements – Replaces 800 LF of 4” CIP with 8” DIP to replace aging / undersized infrastructure and improve fire flows. 15‐59 – Valdez Avenue Improvements – Replaces 1,000 LF of 4” CIP with 8” DIP to replace aging / undersized infrastructure and improve fire flows. 15‐60 – Escondido Way Cross Country Abandonment – Abandons 300 LF of 4” CIP located between two homes to eliminate aging / undersized infrastructure. 15‐61 – Chula Vista Drive Improvements – Replaces parallel 6” / 8” CIP with a single 10” DIP to complete a uniform 10” water main between Hannibal Pump Station and Exborne Tanks, eliminates aging infrastructure and reduces maintenance. 15‐62 – Sixth Avenue Improvements – Abandons 700 LF of cross country 6” – 8” CIP that crosses over an existing creek at two locations and replaces it with a combination of 350 LF 8” and 1,260 LF 10” DIP to relocate the water mains to accessible locations. 15‐63 – Lower Notre Dame Improvements – Replaces 3,400 LF of parallel 6” ‐ 8” CIP with a single 10” DIP to replace aging infrastructure and reduce maintenance. 15‐64 – Tierra Linda Improvements – Installs an in‐line gate valve at Tierra Linda Middle School in order to monitor water quality under an experimental dead‐end scenario. 15‐65 – Folger Drive Improvements – Replaces 830 LF of 6” CIP with 8” / 10” DIP to replace aging infrastructure and improve fire flows. 15‐66 – Vine Street Improvements – Abandons 250 LF of 4” CIP and the Vine Street Regulator, replaces 700 LF of 4” CIP with 6” / 8” DIP to replace aging / undersized infrastructure and improve fire flows. 15‐67 – Village Drive Area Improvements – Replaces 1,600 LF of 6” CIP with 8” DIP to replace aging infrastructure and eliminate two small dead‐end stubs. 15‐09 – Dekoven Tank Utilization Project – A replacement / new installation combination of 2,300 LF of 12” DIP allowing abandonment of two cross country water mains and zone wide fire flow improvement. 15‐10 – Notre Dame Avenue Loop Closure – A replacement / new installation combination of 2,230 LF of 8” DIP to eliminate dead ends, replace aging / undersized infrastructure, and improve fire flows. 15‐11 – Carmelita Avenue Improvements – Replaces 1,300 LF of 4”‐ 6” CIP/PVC with 8” DIP to replace aging / undersized infrastructure and improve fire flows. 15‐12 – Buena Vista Avenue Improvements – Replaces 1,250 LF of 4”‐ 6” CIP/PVC with 8” DIP to replace aging / undersized infrastructure and improve fire flows. 15‐13 – Monroe, Bellemonti, Coronet Avenues Improvements – Replaces 3,200 LF of 4” PVC with 8” DIP to replace aging / undersized infrastructure and improve fire flows. 15‐14 – Mezes Avenue Improvements – Replaces 310 LF of 4” PVC with 8” DIP to replace aging / undersized infrastructure and improve fire flows. 15‐15 – Shirley Road Improvements – A replacement / new installation combination of 720 LF of 8” DIP to eliminate dead ends, replace aging / undersized infrastructure, and improve fire flows. 15‐16 – Williams Avenue, Ridge Road, Hillman Avenue Improvements – A replacement / new installation combination of 2,460 LF of 8” DIP to eliminate dead ends, replace aging / undersized infrastructure, minor zone reconfiguration, and improve fire flows. 15‐17 – Monte Cresta Drive, Alhambra Drive Improvements – Replaces 2,250 LF of 6” CIP with 8” DIP to replace aging / undersized infrastructure and improve fire flows. 15‐18 – Pine Knoll Drive Improvements – Replaces 430 LF of 4” CIP with 8” DIP to replace aging / undersized infrastructure and improve fire flows. 15‐19 – Oak Knoll Drive Improvements –Replaces 920 LF of 4” PVC with 8” DIP, relines or installs 350 LF 8” HDD DIP to reduce a long dead end, replace aging / undersized infrastructure, and improve fire flows. 15‐20 – Thurm and Bettina Avenues Improvements – Replaces 1,150 LF of 4” PVC with 8” DIP to replace aging / undersized infrastructure and improve fire flows. 15‐21 – Lincoln, Monserat Avenues Improvements – Installs 250 LF of 8” DIP with 8” DIP to eliminate two dead ends, creates a loop, and improves fire flows. 15‐22 – Arthur Avenue Improvements – A replacement / new installation combination of 880 LF of 8” DIP to replace aging / undersized infrastructure, eliminate two dead ends between Zone 2 and Zone 3, install a PRV connection between the Zones, and improve fire flows. 15‐24 – San Juan Boulevard Improvements – Abandons 200 LF of 4” CIP paralleling an 8” PVC, replaces 520 LF of 6” CIP with 8” DIP to replace aging / undersized infrastructure, reduce maintenance, and improve fire flows. 15‐30 – Alameda de las Pulgas Improvements – Replaces 1,455 LF of 6” ‐ 8” CIP with 8” DIP to eliminate bottlenecks, replace aging infrastructure prone to breaks, minor reconfigurations to simplify system. 15‐31 – Monserat Avenue Cross Country Abandonment – Abandons 355 LF of 6” CIP to eliminate an inaccessible cross country water main. 15‐89 – Dekoven Tanks Replacement – Replaces the existing 1.0 MG and 0.7 MG originally constructed in 1952 with two 0.8 MG tanks to improve seismic reliability. 15‐90 – Alameda De Las Pulgas Loop Improvements – Installs 1,100 LF of 8” DIP to eliminate two dead ends, creates a loop, and improves water quality. 15‐08 – Zone 4 Water Main Improvement Project – Replaces 1,300 LF of 4” PVC with 8” DIP to replace aging / undersized infrastructure and improve fire flows. 15‐01 – Buckland / Shelford Avenues Improvements – Abandons 270 LF of 6” CIP paralleling a 12” DIP. New connections will be made to the 12” DIP along with other pipe installation to improve fire flows. 15‐02 – Courtland Road Improvements – Replaces 780 LF of 4” – 6” CIP with 8” DIP to replace aging / undersized infrastructure and improve fire flows. 15‐03 – Spring Lane Improvements – Replaces 270 LF of 4” CIP with 8” DIP to replace aging / undersized infrastructure and improve fire flows. 15‐04 – Rose Lane Improvements – Replaces 170 LF of 4” CIP with 8” DIP to replace aging / undersized infrastructure and improve fire flows. 15‐05 – Calwater Intertie – Installs an intertie connection to permit the District the ability to provide water to Calwater in the event of an emergency. 15‐06 – Zone 5 Fire Hydrant Upgrades – Adds 7 hydrants between Desvio Way, Solana Drive and Altura Way improving fire flow protection and flushing operations. 15‐88 – Vine Street Improvements – Replaces 1,400 LF of 6” CIP with 8” DIP to replace aging / undersized infrastructure and improve fire flows. 15‐07 – Dartmouth Avenue Improvements – Replaces 410 LF of 4” CIP with 8” DIP to replace aging / undersized infrastructure and improve fire flows. 15‐25 – Christian Court Improvements – Replaces 300 LF of 4” CIP with 8” DIP and installs an additional fire hydrant to replace aging / undersized infrastructure, improve flushing capabilities, and improve fire flows. 15‐26 – West Belmont Tank Water Main Improvements – A combination of abandonments / replacement / new installation of 1,400 LF of 8” DIP and 2,400 LF of 12” DIP to eliminate cross country and parallel water mains, improve zone wide fire flows, and replace aging infrastructure. 15‐27 – Lassen Drive Improvements – Replaces 1,800 LF of 6” CIP with 8” DIP to replace aging / undersized infrastructure and improve fire flows. 15‐28 – Tahoe Drive Area Improvements – Replaces 900 LF of 4” CIP with 8” DIP to replace aging / undersized infrastructure and improve fire flows. 15‐29 – Belmont Canyon Road Improvements – Replaces 900 LF of 4” – 8” CIP with 8” DIP to eliminate a local bottle neck, replace aging infrastructure, and improve fire flows. 15‐32 – Soho Circle Improvements – Replaces 130 LF of 4” PVC with 8” DIP to replace aging / undersized infrastructure and improve fire flows. 15‐33 – Paddington Court Improvements – Replaces 160 LF of 4” PVC with 8” DIP to replace aging / undersized infrastructure and improve fire flows. 15‐34 – Ridgewood Court Improvements – Replaces 200 LF of 4” PVC with 8” DIP to replace aging / undersized infrastructure and improve fire flows. 15‐35 – Bridge Court Improvements – Replaces 280 LF of 4” PVC with 8” DIP to replace aging / undersized infrastructure and improve fire flows. 15‐36 – Parkridge Court Improvements – Replaces 270 LF of 4” PVC with 8” DIP to replace aging / undersized infrastructure and improve fire flows. 15‐37 – Waterloo Court Improvements – Replaces 130 LF of 4” PVC with 8” DIP to replace aging / undersized infrastructure and improve fire flows. 15‐38 – Cliffside Court Improvements – Replaces 330 LF of 4” PVC with 8” DIP to replace aging / undersized infrastructure and improve fire flows. 15‐39 – Zone 8 – 14” Cross Country Improvements – Installs 8 trench dams, 2 remotely controlled gate valves, and a flow meter and/or pressure gauge vault to allow the District to quickly identify a leak along the water main, the ability to isolate a shorter section of repair length. 15‐40 – Hastings Drive Improvements – Replaces 550 LF of 4” CIP/PVC with 8” DIP to replace aging / undersized infrastructure, improve fire flows, and also installs a Zone 8 to Zone 2 jumper to be used in emergency situations. No projects identified in Zone 9. 15‐83 – Emergency Intertie Rebuilds – Rebuilds / reconfigures the existing interties to obtain more accurate meter readings. 15‐86 – Folger Pump Station Site Demolition – Demolishes the existing pump station building at the abandoned Folger Pump Station. 15‐91 – SCADA System Replacement – Replaces the existing SCADA system. 15‐92 – AMI Installation Completion – Adds automatic meter reading capabilities to each service meter allowing the District and residents to monitor water use remotely. 15‐93 – Dairy Lane Facility Rehabilitation and Improvements – Includes various improvements to the District’s facilities.